It’s easy to use a phrase over and over without ever really thinking about it or explaining it in any great detail. The word Otokodate is one such instance and I am aware that we use it at the gallery without clearly defining it. Otokodate doesn’t have a handy English language translation – the anachronistic and unsatisfactory phrase ‘street knight’ is the commonly used definition and it no longer fits our phraseology nor is it very accurate. Otokodate is an archetype of kabuki more than anything else. In the popular imagination (especially of the nineteenth century) the early Edo period was lawless and yet social class was strictly defined. Peasants were without rights in the presence of samurai and the imbalance led to horrific abuses of privilege and great tragedy. This became more acute as the actual strength of the samurai diminished in the eighteenth century and the merchant and artisan class became economically more powerful. It became popular to invent stories of retribution and justice where the hero was a rough and ready, yet brave and principled character who when witnessing samurai cruelty stepped in to defend the underdog. This class of popular hero became known as the Otokodate. The ideal Otokodate would have been originally from the samurai class, poor himself and yet uninterested in reward for its own sake. He would be a supreme combatant and effortlessly charming and successful (especially with women). Above all, in his own way, he should hold the key principles of Bushido (the traditional samurai code) very clearly – especially those of honour and duty. Nevertheless the otokodate made their living by gambling and were reckless both in love and in combat. It is important here to see how these qualities and their popularity with the burgeoning townsfolk and merchant class had political overtones. The samurai, protected in law and in constitution from taxation or work were hugely resented and associated with the autocratic rule of the Tokugawa Shogunate. By the nineteenth century they were akin to wasps at the end of a hot summer – redundant, lazy and aggressive. The otokodate were theatrical and folk emblems of popular unrest and social resentment – through these representations the populace found harmless ways to laugh at the humiliations of the ruling class. The archetype has resonance in many cultures; in England the just and heroic figure of Robin Hood pitted against the cruel robber baron of Sherwood (and like the samurai enjoying the protection of the state) is one such example that springs to mind. Like the Ronin (leaderless samurai) the anti-establishment otokodate continues to grow in the popular imagination. The character also appears in video games and japanese manga and role playing fiction. 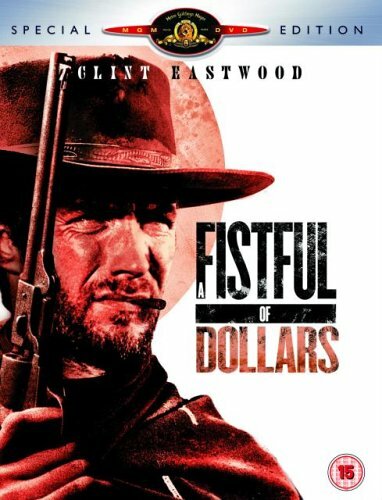 Outside of Japan, the Americans imported the character from the great movie maker Akira Kurosawa, firstly in the interpretation of his film Seven Samurai from 1954, remade in 1960 as The Magnificent Seven; and then in 1964 in the film A Fistful of Dollars starring Clint Eastwood, an unofficial reworking of Kurosawa’s Yojimbo from 1961. All of these films make use of the otokodate as their main theme and the otokodate remains the character prototype for many of the roles that Clint Eastwood and his imitators subsequently took. In The Magnificent Seven, seven outlaws – all of them classic otokodate prototypes – assist a poor Mexican village to defend themselves and their harvest against a clan of bandits who have terrorised them for years; there is a convenient parallel between the rural world of the Shogunate and the lawless towns of the American mid-west. The six shooter has replaced the katana (samurai sword) and the riding cape the kimono but aside from detail, the mis-en-scene remains neatly similar. 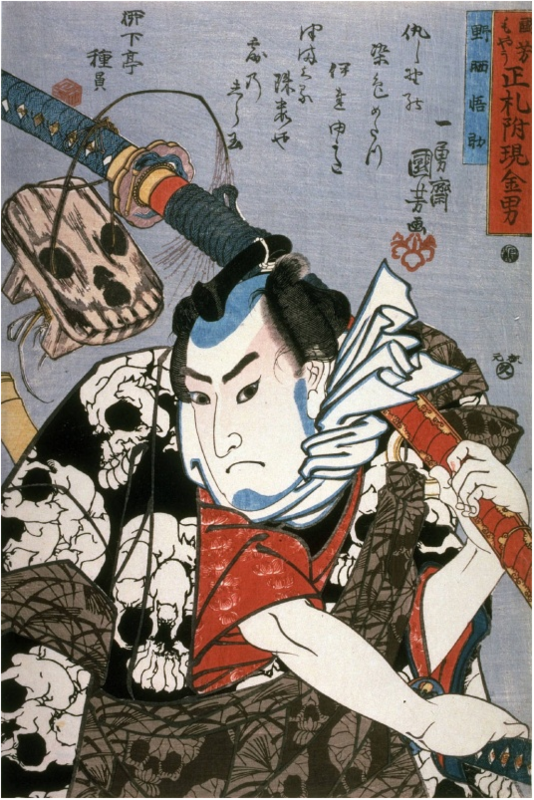 In Japanese prints the otokodate or his type is a staple of actor portraits since, as we have seen, the character was popular in kabuki plays and is pictured in brightly patterned costumes, forehead shaved and hair tied and striking an heroic or casual pose. The picture of Nozarashi Gosuke by Kuniyoshi is typical of the otokodate ukiyo-e with its portrayal of swagger and lavish costume. Equally beautiful is the Kunisada (pictured above right) of Sawamura Tossho playing the role Ume no Yoshibei. Otokadate are often portrayed carrying a pipe or fan (see left); this is because they may be behind a form of combat called ‘the art of the iron fan’ in which an iron fan or pipe were used as weapons. Predictably, despite the beautiful woodblock prints, the kabuki plays and the heroics of Kurosawa and Clint Eastwood, the fact is that the otokodate most likely ran a kind of common protection racket for merchants and stall holders and there is evidence that since the banning of these underground clans in the nineteenth century, they became the notorious predecessors of the current day Japanese Yakuza. This entry was posted in Clint Eastwood, Floating World, Japanese Art, Japanese prints, japanese woodblock prints, kabuki theatre, Kunichika, Kunisada, Kuniyoshi, Otokodate, Toshidama Gallery., ukiyo-e art and tagged Akira Kurosawa, Clint Eastwood, fistful of dollars, floating world, japanese art, Japanese prints, Japanese Woodblock Prints, Kabuki, Kunisada, kuniyoshi, otokodate, samurai, Seven Samurai, Toshidama Gallery, Toyohara Kunichika, Ukiyo-e. Bookmark the permalink.